Your life will be measured not in terms of how much you did, but by the depth and quality of your love—that is, by how much you received of God’s love. Every test of life is a test of love: What do you love? Who do you love? Whose love do you love? Every day, our lives answer these questions. Do we see it? “The man in truth, facing the realities of life, can receive Christ immediately. “We want to know God…but it is duplicity that keeps us from seeing only Him. We struggle with unbelief…and do not realize that it is deceit that keeps us from faith. We long to be loved…yet we do not see that deliberate pretense keeps us from experiencing the love of God. 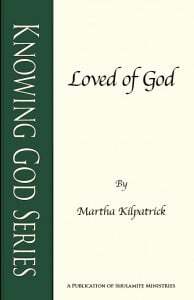 Loved of God is now available in both print and digital format. We don’t know love. And the illusion that we do keeps us from the reality of genuine God-Love. You will never be fulfilled until you know and experience God’s love for you. Personally. You will always be clawing and devouring…and punishing somebody to get love. Because the God-made void that is in all of us, is a cavern yawning for love. We are desperate for love. We like to be self-complete and sophisticated but we are all just children, desperate for love. I am desperate for love. You are desperate for love. We sell our souls to get love, because love is the great, unending need we all have. of that love, what is the breadth and length and height and depth of it. That you may really come to know practically through experience for yourselves the love of Christ, which far surpasses mere knowledge, filled through all your being unto all the fullness of God. That you may have the richest measure, the divine presence and become a body wholly filled and flooded with God Himself. Then Paul goes on to say: “God is able to do exceedingly, abundantly above all we can ask or think about love” (v. 20). And that is what love is… Love is exceedingly, abundantly above all we can ask or think. What we do, we do to get love. We move from a need to gain love. That search for love is what motivates most of us—most of the time. When we are living-loved by God, then we are “compelled by the love of God” (2 Cor. 5:14), as the energy and motive of action. You and I have to be humble enough to understand how much we need God’s love. We ask a lot of questions of life and of God, but I tell you, life questions you! Life probes you! We don’t know the question life is asking, much less the answer. Do you know the question life is asking you? In every relationship, in every event, in every experience, life asks you: Who do you love? And what do you love? And whose love do you love? Every test of life is a test of love: what you love, and who you love, and whose love you love. And we don’t know what we love until life tests and exposes our hearts. Twenty years ago I would have told you that I loved God with everything in me. Then life tested me and burned me and tried me and crushed me, and I found out what I loved, and who I loved, and whose love I loved. So…don’t tell me what you love. Tell me how you spend your time and I will tell you what you love. Don’t tell me what you love—tell me what you worry about and I’ll tell you what you love. Don’t tell me what you love—tell me what you think about and I’ll tell you what you love. Tell me what you fear and I’ll tell you what you love. Tell me what you give your energy to and I’ll tell you what you love. One thing is needful and Mary has chosen that one thing. I used to say: “God, what is that one thing? I want to know that one thing because it “shall not be taken from her.” What did she choose? She chose to love God when God’s love came. She chose what she would give her life to…and it was Jesus, the “Son of His love” (Col. 1:13 NKJV). It is a choice. Above all else, it is a choice of response. And I tell you this—that choice, when there is the loss of all else—including His realized presence (when He seems to be gone), that choice to love Him will take you through. It is impossible to take that choice from you. You can be wrecked, ravaged, abused and scorned, despised, slandered and rejected…yet nothing and no one can touch that core of His love for you and your love for Him. Not even you! Everything in the world opposes and sets out to kill this love. When Mary of Bethany, this same Mary, anointed Jesus with oil for His burial, from that event Judas went out and betrayed Him. From that event Satan entered Judas. I think I understand something about why that was so offensive to Judas. Her act of pure devotion—extravagant and abandoned—evoked in Satan a jealous rage. He wants such worship for himself! Such a love for God caused Satan to enter Judas and drove the man to go and sell Jesus. Such love for Christ exposes the hatred of God just in being around a Mary of Bethany. It forces you to see what you love…and what you hate. It provokes that kind of response. We measure love by flattery. For years I thought the people who flattered me the most were the ones that loved me most…and they were the ones who hated me. Sometimes the people that had the most words of love for me had the most betrayal—and the most cruelty. We measure love by words. We gauge it by that standard. But God measures love by obedience because what you love, you obey. You are today, you did yesterday, what you loved. What you wanted to love you, you served. You laid down your life, gave up yourself for it. Everyone does it. The question is: what have you chosen to do it for? For whom have you chosen to lay down your life? Because you will. I’ve done it. I have given up my personality to be loved. I would (or I might) give up most everything…just to get love. But God sees that our need is to know and enjoy His Love. Then obedience is natural. He knows that: “If you love Me, you will obey My command” (Jn. 14:15 NASB). If we are not obedient, it is a problem of love, not of obedience. There isn’t any problem of obedience…except a problem of love. There isn’t a problem of rebellion. Rebellion exposes a failure to love, or what you love. If you only obey God out of obligation, He doesn’t want that. He understands, and He wants us to understand, that He measures love by obedience.